Bigger, faster, and thinner than its predecessors, the iPhone 6 pushes the bar up even further by adding a host of new features. 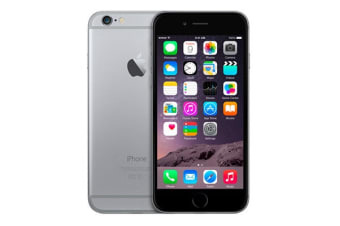 A large 4.7” Retina HD display on a beautifully sleek body makes the iPhone 6 a must have. Featuring a powerful A8 chip, it beats its predecessors hands down in speed. It also features an M8 motion coprocessor that continuously measures data from the accelerometer, compass, gyroscope and barometer, enabling a range of apps to track your elevation, distance and movement. The iPhone 6 enables you to record videos and take pictures with a new delight thanks to the fantastic sensor with Focus Pixels and new video features on the iSight camera. Transfer data at close range by 'bumping' other NFC compatible devices. It's as easy as waving your device next to another to transfer, stream or communicate information without having to pair! Siri is a digital personal assistant, which can perform tasks based on voice input. Take a memo, start a phone call, write a text message or start a web search simply by talking to your phone.